Today’s post is a guest post from my sister, McKenna. She also created a free Sabbath day printable that you can download to take notes and record your thoughts on Sundays! This is her experience about getting more out of the Sabbath Day. When I was little I always loved going to church on Sunday’s. I don’t know if that was because my parents loved going and it showed or because I loved seeing my friend all I know is that Sunday was the best day of the week. As I grew older the feeling was still there I became a young woman, and during those years I truly developed a testimony of Heavenly Father and Jesus Christ. My testimony wasn’t huge but it was strong and I knew that I was a daughter of God and that He would always look after me. Church was still one of the best parts of my week. I was able to pay attention and get things out of each meeting that helped sustain my faith. Then I started going to the singles ward when I graduated from high school and my faith faulted. It is not that I didn’t study or have a testimony but church on Sunday didn’t seem to really matter anymore. I would go to all my meetings and go through the actions but I didn’t learn anything or really care what was said. I moved out and started going to a BYU singles ward and that helped a little. I was engaged in church callings and I had friends that loved going to church but I still didn’t get much out of it. And that struck me. He had never been to a boring sacrament meeting… in my head, I was thinking how is that possible? And then I got thinking about myself. Why was I bored at church? Why didn’t I get anything out of the meetings I was going to? Was it because of the speakers or the teachers? Or was it because of me and the lack of preparation I had come to church with? This got me really excited and ready to change MY attitude about Sabbath observance and what I could do to get more out of my worship. That same day after coming home from church I asked myself this question: WHY? Why do I go to church? What is the purpose? We all have different reasons why we attend and that is ok. None of us are the same, we all think and act differently. But once we know what the reason is we can truly reflect on if that reason will keep up going. Or see if we can find the motivation to keep going for more than just that one reason. I soon discovered that as I changed my attitude and tried to find different reasons why I was going and resolved that I would never have a boring Sunday meeting again. The next few months were great. Sunday worship was more focused on God and what He was trying to tell me. Let me say though this new habit didn’t last long. I am human and I fell into a slump of Sunday blues again. This past year I was called into nursery and I loved the calling. I loved being around the sweet spirits and testifying that they are children of a Heavenly Father who loves them so much. I noticed after a few months that I wasn’t feeling the spirit as much as I used to and I was missing something in my life. What a bold statement! Preparing to worship for church each Sunday will increase the spirit in our lives and enable us to learn more and get more from our church services. It is up to us to get out of church anything and everything. One other thing that helps is taking care to remember! Remember is a powerful word. If we are prepared each Sabbath and have come ready and willing to feel the spirit we should have a way to record and keep track of those sacred experiences that we will have. I have created this printable to use on Sunday to ponder and ask questions and to keep track of the things Heavenly Father wants me to learn each time I go to worship Him. I am so grateful for my journey of faith and trial to come to know that we are responsible for our own learning at home and at church. The teachers prepare but we must as well. God wants to give us revelation but how can He if we are not open to hearing it. We are not perfect but we can try. Prepare at home to have the spirit with you as you attend church meetings, pray for answers to questions, ponder the feelings in your heart as teachers teach and you listen, and WRITE down the things that you feel. Getting more out of the Sabbath day will come little by little and we give more of ourselves to HIM. 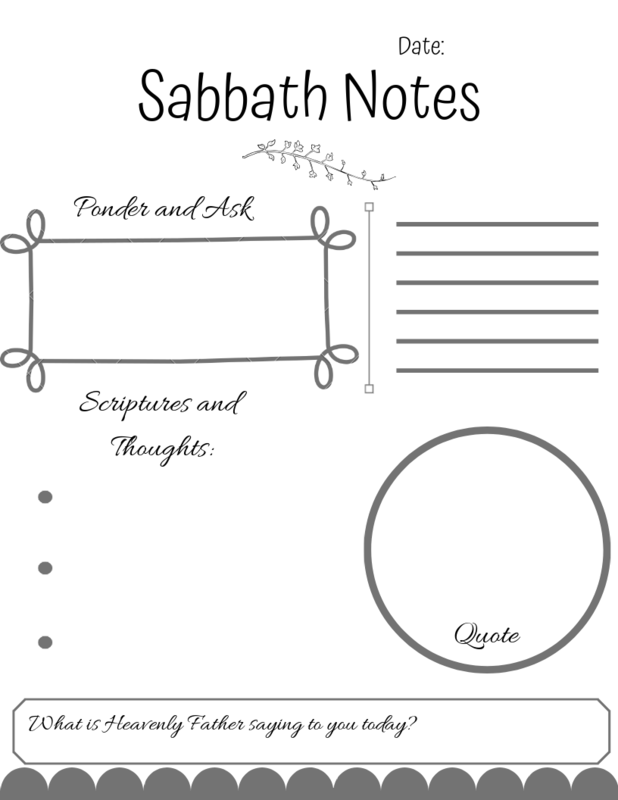 Grab your free Sabbath Notes Printable! Don’t forget that A Christ-Centered Faith starts today! You can sign up here if you haven’t yet!